Last year I was raving about Tall Oaks, a truly special debut that ended up being one of my favorite reads of 2016. 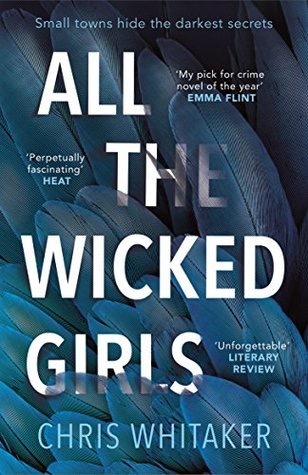 I couldn’t wait to get my hands on All The Wicked Girls and I was simultaneously giddy and nervous when I started. I was so enraptured by TO that I worried that maybe I wouldn’t be as crazy about this one but all that worry was totally unnecessary as this was another amazing read that blew me away just as much as TO did. I have a hard time reviewing books that truly move me and I think I may have finally found a structure that works for me recently with my review of The Good Daughter. I’m going to try that approach again here and hope that it shows you guys just how much I loved this book. Small town America has never been portrayed so brilliantly. What does a U.K. based author know about life in small town southern America? If you’re Chris Whitaker, EVERYTHING. ATWG is set in Grace, Alabama in the nineties and he captures the dynamics of a small southern town perfectly. Grace is a town full of despair and oppression, the residents are so tired and defeated, there is an overwhelming feeling of desperation and hopelessness that made me feel stifled and weary. Evoking unexpected emotions is always the hallmark of a gifted storyteller in my opinion. There is such a strong sense of place that imagining this town was effortless. His writing is intense and his voice is wholly unique. Adding to the amazing setting is the stylized writing used, the Southern expressions and mannerisms were dead on and I instantly found myself reading Whitaker’s prose in a lazy drawl. The weather plays a large role and I was immersed in the atmospheric nature by the extremely well crafted imagery he created. I can so easily imagine this town that I would love to see it as a movie! For everyone that loved Manny in TO you’ll be pleased to know that Whitaker’s ability to create a memorable teenage boy was not a fluke. Noah and Purv are best friends who help Raine search for her sister, Summer and they were both the type of characters that you can picture leaping off the pages and walking down the street, they’re truly larger than life. Chief Black is a man with the weight of the world on his shoulders and Samson may be one of the oddest fictional characters I’ve ever encountered. That’s just a taste of the flawed, raw, astounding cast that features in this book. He writes thrillers that make you feel all of the feelings. Very few writers can move me to tears, I’m pretty stone cold but I definitely shed a few tears while reading this. Alright fine, it was more than a few tears, Whitaker completely shattered my heart and took my emotions on a roller coaster ride of epic proportions. I also laughed though, there is humor here as well which brings levity to an otherwise dark plot. He also explores dark themes such as domestic violence, drug abuse, poverty, loss and love in such a profoundly poetic way, its breathtakingly beautiful. He takes intricate plotting to a new level. I’ll stop rambling now but I’ll finish by saying that this book proves that Whitaker is a force to be reckoned with, he is insanely talented and I would be honored to read his to do list. If you haven’t read TO yet, what are you waiting for?! Then when you get done and are desperate for more grab this one. Agree completely. I think I loved this one even more than Tall Oaks. Or not, I don’t know. Hahaha BOTH. It was amazing, my favorite of the year so far and I also cried. The characters, the unpredictable mystery, the tragedy… it was perfect. I can’t pick a favorite either! Wouldn’t that be awesome?! I would love to chat with him. Wow, a 5 star review in a wonderful format! Love it! Great format! Nice review too! Absolutely loved this book. Great review. Totally agree about capturing the spirit of small town USA in 90s. And I loved the Noah and Purv dynamic. Brilliant. Brilliant review of a brilliant book! and love the format of your reviews- very effective! !